This client is an English man who spends lots of time hiking in the Las Vegas sun. 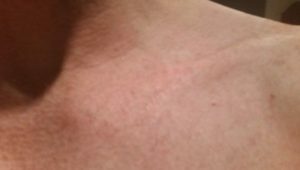 He has had these sun spots on his collar bone for over 25 years. 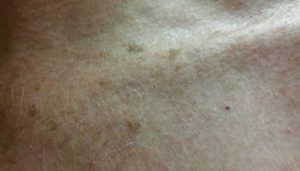 He has considered removal treatments for years but was hesitant about the results he would achieve from Sun/Age Spot Removal. At Skin City Laser. he finally took the leap! We did a consultation prior to beginning his treatments. I explained the process would take a few seconds and that it would feel like a minor sting. We discussed the after care and expected results and time frame for total removal.We set up a schedule for the anticipated two sessions needed and got down to work. The above picture is before the first session for Sun Spot Removal at Skin City Laser. You can see the two large spots on the collarbone and surrounding area. The laser used is a Revlite yag nd q-switched laser. It is the gold standard in the industry. It is capable of removing spots on all skin types. We waited for about three weeks. In this time the surface skin that I lasered will slowly slough off leaving healthy skin behind. The spot was about 50% lighter at this point. To achieve total removal, typically 2-3 treatments are needed. Individual results will vary based on the clients skin tone and the severity of the Sun Spot. We did the second and final treatment a month after the first one. And a month after the second treatment you cannot tell where the spots were. In conclusion, the below picture shows the Sun Spot Removal to be 100% effective.